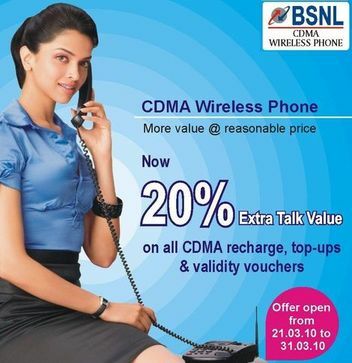 In a bid to provide affordable mobility Bharat Sanchar Nigam Ltd (BSNL) today announced 20% Extra Talk Time on Top-Up and Recharges for its Prepaid CDMA Fixed Wireless Phone (FWP) and CDMA Mobile subscribers in Maharashtra & Goa telecom circle. The company already offers Full Talk time on all CDMA Top-Ups. Now as a promotional BSNL CDMA Mobile and FWP subscribers can enjoy additional 20% talk time which is available on all CDMA Recharges from Rs.99 to Rs.999 and all Top from Rs.10 to 100. The offer is valid up to 31st March. BSNL also upgraded its Existing CDMA network into EVDO network to provide seamless High speed Wireless Internet in all SSA across the Maharashtra and Goa circle through its EVDO Data Card services. And not giving 20% benifit to data card user’s.